About 135 kilometers from Mangalore and 80 kilometers from Udupi, in the Kodachadri Valley, the summit of the Western Ghats nestles in the serene city of Kollur. Here is the famous Mookambika temple on the banks of the river that never dries Sauparnika. This beautiful temple of Mookambika, crowned with golden roofs and copper, attracts thousands of pilgrimage. The most important pilgrimage sites that attract pilgrims from all over India. The temple is dedicated to Mookambika and stands on a spur of the summit of Kodachadri. 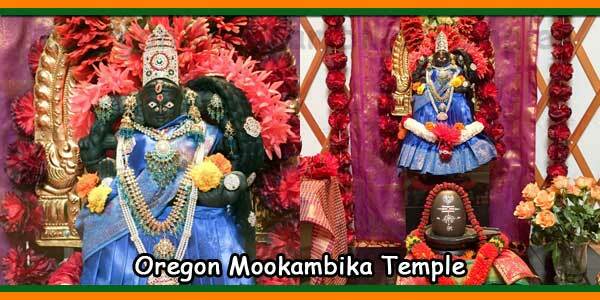 The goddess Mookambika has the shape of Jyotir-Linga incorporating Shiva and Shakti. It is claimed that the image of Panchaloha (mixed metal of five elements) of the goddess Shree Chakra was consecrated by Adi Shankaracharya during her visit to this place. There is an exquisite sculpture of Panchamukha Ganesha. Kollur is considered one of the seven Muktislala pilgrimage sites in Karnataka (Kollur), Udupi, Subrahmanya, Kumbasi, Kodeshwara, Sankaranarayana and Gokarna. Kollur is known for his association with Aadi Sankara. 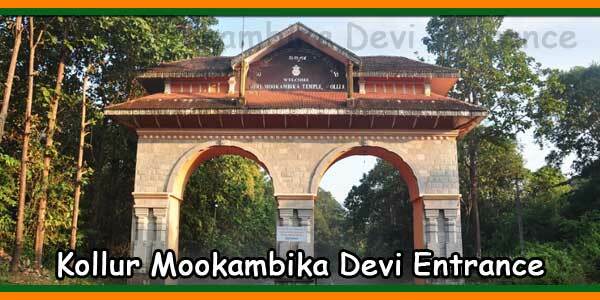 It is said that Mookambika appeared here in front of Aadi Sankara and that he would have installed her image in this sanctuary. There is a room near the sacred place, which consecrates Sankara Simhasanam, which is considered the place where he meditated and had a vision of Mookambika. 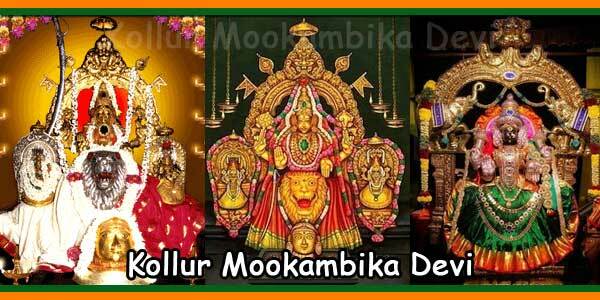 Mookambika is considered a manifestation of Shakti, Saraswathi and Mahalakshmi. Long ago when a demon called Kaumasura obtained a boon from Lord Shiva was reigning pompously, Kodachadri became the hiding place for all the gods and divine beings who became helpless against his harassment. While the Saptarishis were engaged in prayers and poojas to bring about the end of demon kaumasura, Guru Shukracharya enlightens him about his impending death at the hands of a woman. Learning this, kaumasura performs an austere penance t please Lord Shiva. When Lord pleased with his prayers, appears before him and asks him to name the boon that he wishes, Vagdevi, the Goddess of speech senses that this could lead to a greater devastation and makes him speechless. The dumb Kaumasura then becomes unable to verbalise his wishes and then onwards he is called Mookasura. Soon after, on the request of Kola Rishi, the goddess creates a mystical power by bringing together the individual powers of all the gods who had assembled. This Divine Power wages war on Mookasura and brings about his destruction, thereby granting him salvation. The place where devi killed Mookasura is known as “Marana Katte”. 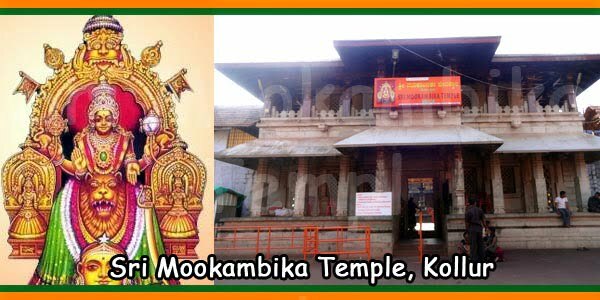 Since that day, the Goddess has resided at this holy place Kollur by the name Mookambika, fulfilling the wishes of all her devotees. Here resides Sreedevi in the Padmasana posture, of a serene countenance, and with three eyes, bearing always a shankha, a chakra and with a pleasant appearance as the embodiment of mantra to bless the devotees.. The installation of the idol at Mookambika temple has a history as ancient as about 1200 years. As suggested by Rani Chennammaji, the feudal lord by name Halugallu Veera Sangayya has covered the inside of the temple with stone. 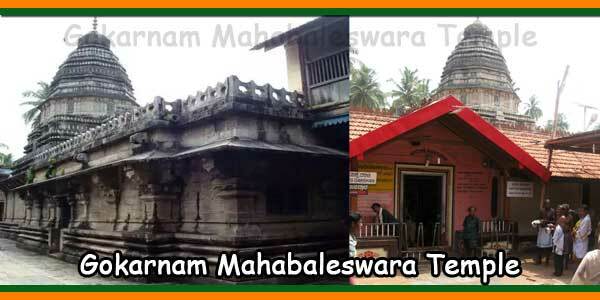 When we look at the temple structure, we find the sanctorum, then entrance hall and then the Lakshmi Mantapa. There are four pillars at Lakshmi Mantapa and on upper portion of each of these pillars, we find beautifully carved images of various gods. Prominently, they have sculpted the images of Ganesha, Subrahmanya, Naga, Mahishasura Mardini and the goddess in different postures as delineated in Devi Mahatma. Earlier, this made up the total temple structure and the outer prakara was not present. So Veera Sangayya also took up the prakara, as per the principles of temple architecture. We may also find beautiful images of Ganapathi atop the doors situated at the entrance to Garbhagriha, Lakshmi Mantapa and the Mukhya Dwara (main entrance). It is normal practice in any temple to depict the main deity over the entrance, and the fact that all three doors carry the carvings of Ganesha is considered to be of special significance. There are many inscriptions at Kodachadri that relate the tale of time. The Prakaras, which underwent renovation from time to time, hold a mirror to the changing mores in architecture during bygone cultures. Specifically the Vaasthu of Garbhagriha structure is very ancient and extraordinary. The Garbhagriha is single yoni flag size (Eka yoni pramana dwaja aya). Pre entrance has a three flag proportion and is about 30 feet wide and 12 feet long. Lakshmi Mantapa measures 134′. 11″. Then comes the prakara. Beyond that, is Navaranga Mantapa. Outside the temple is a large and beautiful Deepa Sthambha ( a pillar to hold lamps). This has 21 concentric circles in which the lamps can be lighted, and when viewed from Kodachadri, one would feel as though we were looking at the Divine Makara Jyothi at Lord Manikanta’s Shabarimale. Swayambhulinga manifested itself when Parameshwara drew the Srichakra with his toe and Kola Maharshi performed a long lasting penance in its vicinity, as a result of which power of meditation spread far and wide on the earth. Udhbhava linga is the tangible form of Sri Chakra Bindu that is said to have the proximity of all gods. 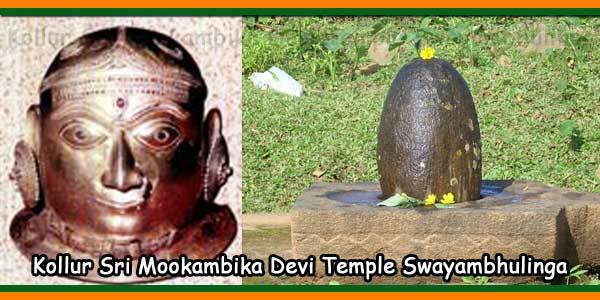 It has a very high significance since Shri Mookambika Devi has merged with this Linga and fulfills the desires of devotees. A golden line has formed in the swayambhu Linga and it is wider on the left side as also taller. It is believed that Goddess Lakshmi, Parvathi and Saraswathi have all merged in the left side and the Lord Parameshwara, Lord Vishnu and Lord Brahma resides in the right side of the Linga. Besides the golden line, it is also said there is an image (carving) of Shiva injured by Arjuna’s blow during the clash of Kiratharjuna, on the right side of the Linga. Towards the left, we may find the image (carving) of Gopada (foot of the Holy cow) at the Shakthi Peeta. Adi Shankara (Vedic scholar and saint) has perceived and realized Goddess Mookambika as residing thus. 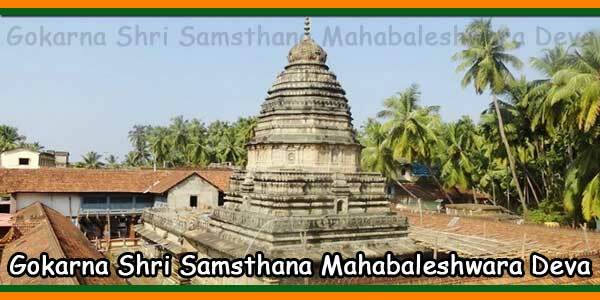 Adi Shankaracharya appeared here leading Shri Saraswathi with a view to finding a place for enshrining her. He stopped at this temple, fixed Shrichakram and on it installed the idol of Mookambika which is the central idol behind the lingam. On the either side of this are idols of Kali or Parvathi and Saraswathi. The place where sage stayed and did penance and the gate by which he left are at the back of the Mulasthana and to north respectively. Votaries to the temple are allowed the privilege of sitting at the place and passing under that gate for a fee. The temple has been patronized by ancient Hindu Kings and several parts in it are still believed to contain valuable treasure. This was the state temple for the Nagara or Bednore Rajas and many of the jewels now adorning the idol are said to have been presented by them and by their overlords of Vijayanagara. Here pooja practices are based on two disciplines- one as per vathula, which is one of the 28 vedas of Shaivagama, and which includes the rituals of Bali (sacrifice); secondly, as per Vijaya yagama Shastra. The five different poojas performed at the temple everyday are during Dantadavana (brushing the teeth), morning, afternoon, evening (pradhosha) and night. Pradosha Pooja is also called as “Salam Mangalarathi”. It is said that Tippu Sultan, the ruler of Srirangapatna, once arrived here during pradosha pooja, witnessed the Mangalarathi, and became so impressed with the Devi, that he offered a Salaam in Muslim tradition to the Goddess, hence the name came into use. Complementary to this account is the practice observed every year, when the Muslim brethren visit the temple on a specific day for the darshana of the Goddess. This special feature has been in vogue for many years now. Of the various festivals and other celebrations held at the temple, “Sharannavarathri” which is held usually during October, and “Brahma Rathotsava” held usually in the month of March are both very prominently observed. There are several instances of childless couples, the dumb, the blind and many such other people making a vow to the Goddess and realizing their desires. When we enter a pradakshina in the outer enclosure, we first find Lord Subrahmanya swamy, then Saraswathi Devi and then Pranalingeshwara, Partheshwara, the deity of Mukhya Prana (with a bell in the tail) installed by Vadiraja, Vishnu Brindavana, a beautiful idol of Gopalakr in Brindaana (considered as upa-pradhana Devatha), the platform of Tulasi then the temple of Veerabhadraswamy, which is the presiding deity. Upon entering this wooden sanctuary, we can see an excellent image of Nrutya Ganapathi, just in the middle of the vault. It is said that Mukhya Prana’s deity was placed right in front of the Veerabhadraswamy sanctuary in order to counterbalance its scary appearance. There is an extensive collection of jewelry in the temple received as a gift of gratitude from the community of devotees who realized their dreams and desires with the blessings of the goddess. Among the various jewels of the Devi, that of the emerald is very precious. Emerald represents knowledge. This temple has two golden processional deities. One is offered by Rani Chennamma as a substitute for the missing of original one. But subsequently the missing one found and thus there are two processional idols. Former Tamil Nadu CM Sri. M. G. Ramachandran (M.G.R.) Equipped with a sword of God, which weighs one kg. And they are 2 feet long. The former CM of Karnataka, Sri Gundu Rao, gave a similar silver sword. The facial mask of the goddess Mookambika is completely of gold and gifted by Vijaya Nagara empire. Jyothirlinga’s golden mask, donated by Keladi’s Chennammaji, is another unique ornament. The two rivers Agnithirtha & Sowparnika which flow in the sanctuary of mookambika descend from Kodachadri hills. The wee spring of cool water situated in between the temples of Kalabhairava and Umamaheshwara is the source of river Sowparnika. Legend says that Suparna (Garuda) did a penance on the banks of this river praying to the Goddess for the abatement of his mother Vinutha’s sorrows. When the Goddess appeared before him, he prayed that the river be henceforth known after him, Suparna, and therefore came to be called as Sowparnika. At the location where he is said to have sat in penance, there is a small cave even today which is known as “Garuda’s Cave”. This holy river takes birth at the Kodachadri and flows up to the edge of Anthargami (now oluru) region where two more streams called Bhrungisha and Pippalada join it. Then it flows westward, surrounding Kollur in the name of “Sampara”, and proceeds to join the sea near the temple of “Maharajaswamy” (Varahaswamy) at Maravanthe. It is believed that river absorbs the elements of 64 different medicinal plants and roots as it flows, therefore it cures all the diseases of those who bathe in it. Hence a bath in this river assumes significance and is considered sacred. Alankara Pooja: All ornaments will wear by Sri. Devi to have this pooja. This seva is considered as a special seva. Chandika Homa: This seva is to book in a quite advance. At present already booked for three years. Three chandika Homes will be performed in every day. The Devotees who are interested to this seva, the date of the Chandika Homa is to be determined by the Temple office, After fixing the Chandika Home date, he/she has to come a day earlier to this Sri Kshethara/holy place, the lodging room will be reserved as per the Reservation payment.This seva at present costs Rs. 5,000/- as a Seva charge. Starting at 8.00 AM in the morning and ends by 11.30 AM. The Devotees of this Homa Seva, has to come in a very cleaned manner, and to have the Darshan of the Devi, and to have the Sankalpa of this Chandika Homa, later on, the coffee and Tiffin can be finished. This Homa is one of the special Homa performed in this Srikshethara. When one prays in a place of worship, the conductive atmosphere facilitates communion with the internal fact, which is the supreme source. The sincere desire for spiritual expansion refines the mind, making it wiser, more capable, and happier. Darshan: The Temple opens early morning at 5.00 AM One experience an unforgettable sense of sublime peace at the time of nirmaalyam, the re-decoration of the idol with flower garlands in the early hours. Then follows the dantadhaavana pooja and the udayakaala pooja. After the sribali pradakshinam the devotees are given a nectarine prasaadam, Gudu Shaanti. The pradoshna pooja takes place a 7.00 PM It is a great occasion of devotional fervour. All the major pooja-s is conducted in the shrine of Sri Veerabhadra also, just after their performance in the inner shrine. After the sribali pradakshinam, the smaller idol that is taken out on such occasions is brought to the hall, Saraswathi Mandapam where takes place mangalaarathi and ashtavaadhana seva. Then the idol is taken back to the inner shrine. After the pooja, a sacred concoction, kashaaya theertham, is distributed to devotees. It is preparation of ginger, pepper, cardamom, tippali, lavangam, jaggari, etc., and is believed to have been introduced by Sri Aadi Shanaraachaarya as a prasaadm of special medicinal value. The shrine closes at 9.00 PM Sri Chandika Homam is an important offering here. Enquiry: Enquiry counter has been opened in Kollur city for convinces of devotees. Devotees from other places can contact below address for further details. Prasadam: The Prasadam will be supplied during the after-noon and evening timings to the devotees. After-noon prasadam will commence from 12.30 PM and closes at 2.00 PM and the night prasadam will commence from 8.00 PM and gets clThe Prasadam will be supplied during the after-noon and evening timings to the devotees. After-noon prasadam will commence from 12.30 PM and closes at 2.00.00 PM and the night prasadam will commence from 8.00 PM and gets closed by 9.30 PM in these type Annssantharpane will be conducted.. The pradoshna pooja takes place a 7.00 PM It is a great occasion of devotional fervour. All the major pooja-s is conducted in the shrine of Sri Veerabhadra also, just after their performance in the inner shrine. After the sribali pradakshinam, the smaller idol that is taken out on such occasions is brought to the hall, Saraswathi Mandapam where takes place mangalaarathi and ashtavaadhana seva. Then the idol is taken back to the inner shrine. After the pooja, a sacred concoction, kashaaya theertham, is distributed to devotees. It is preparation of ginger, pepper, cardamom, tippali, lavangam, jaggari, etc., and is believed to have been introduced by Sri Aadi Shanaraachaarya as a prasaadm of special medicinal value.he shrine closes at 9.00 PM Sri Chandika Homam is an important offering here. Medical Care: Medical Care Centers, Hospitals and Dispensaries opened in Kollur for devotees and employees.